Entertainment for large events in Kitchener, Cambridge, Guelph, and the Greater Toronto Area - including face painting, magic shows, walk-around magic, stilt walking, and balloon animals. Strives for a high level of professionalism and customer service. Quick and easy ​booking process. A Booking Agent is available between 8am-8pm, 7 days a week. Want face painting at your event? Choose kids entertainment to allow the largest number of guests easiest access to that entertainment. This is accomplished by hiring enough kids party entertainers and by choosing entertainment skills more easily accessed by large crowds. Magic shows, stilt walking, juggling, and walk around mascot type costume character are easily accessible and dependent only on the visual and/or audio availability of the entertainer. Ensure the kids party entertainer uses a sound system when performing magic to over 50 guests. Kids entertainment skills which are accessed one children at a time require hiring enough party entertainers. These skills include face painting, balloon twisting, close up magic, spray on tattoos, and character sketches. Hiring enough kids party entertainers to perform these skills can prevent guests waiting a long time to access the entertainment and, in worst cases, waiting a long time yet still being unable to access the entertainment because the entertainer is done working. The calculation involves the number of guests, the length of the event, the number of kids party entertainers, and the speed at which each entertainer performs the particular skill. For instance, if an event is 3 hours with 60 children and an entertainer takes 5 minutes to paint a face, that’s 12 faces per hour, 36 faces in 3 hours, so this particular event would need two entertainers painting faces for the full length of the event to ensure all guests could access the entertainment. Learn more about choosing kids entertainment for a birthday party. A magician or clown can perform a magic show at your Christmas party or other event. 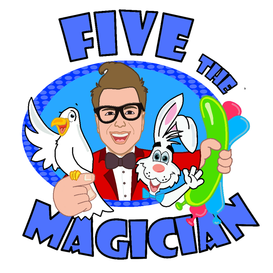 Five the Magician can entertain with an enthralling magic show or Zippee the Clown can provide a circus comedy stage show. A Christmas theme can be added to either show. See more information about the magician, clowns, or characters (i.e. Elmo), or learn more about kids party entertainment offered by Big Smiles Company.